Believe it or not, there are a tonne of different options for motor oil and we’re not just talking about brands. There are a number of factors that differentiate one type of oil from the next. Simply put, viscosity describes the oil’s ability to flow. A lower number means thinner oil, which flows better. A higher number means thicker oil, which seals and lubricates the engine better. In Canada, where the temperature can vary 40 degrees from one week to the next, you usually see multi-viscosity oils, such as 5W-30. The first number refers to the oil’s viscosity in colder temperatures and the second number is the oil’s viscosity in warmer temperatures. Motor oil is more than just oil! There are a number of additives in motor oil such as detergents, anti-wear agents, and corrosion inhibitors that help improve performance and keep the engine running in prime condition. There are even blends designed specifically for high-mileage engines. Depending on your vehicle’s needs, specific additives may be more desirable. While synthetic oils tend to be more expensive than conventional oils, many argue that they are better for engine performance and allow you to change oil less frequently. There are also synthetic blends, or semi-synthetic oils, which combine conventional and synthetic oil. These tend to be cheaper than full synthetics while still offering many of the benefits. With so many choices out there, it can be overwhelming to know what’s best for your vehicle. The owner’s manual is a great place to start. Manufacturers always include a recommended oil for your engine. When in doubt, ask a professional! 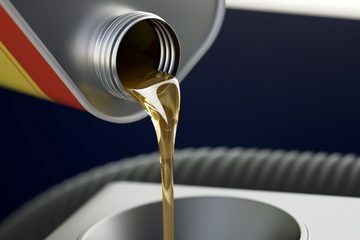 Stop by or contact us today and the expert team at Park Muffler will be happy to answer any questions you have about your vehicle’s oil needs.